Our first PYP Unit of Inquiry for the year is How the World Works, with a focus on Wicked Weather. This is a nonfiction-heavy unit, so I wanted a fun fiction read aloud that still related to our topic. The first in Roland Smith's series The Storm Runners is the perfect book for the occasion. 1. His mother and sister died in an accident. 2. His father was struck by lightning. After those events, his father sold everything they owned and took Chase and an assistant, Tomas, on the road to hunt storms. They arrive before the storm hits and then use their carpentry and repair skills to earn some money after the storm. 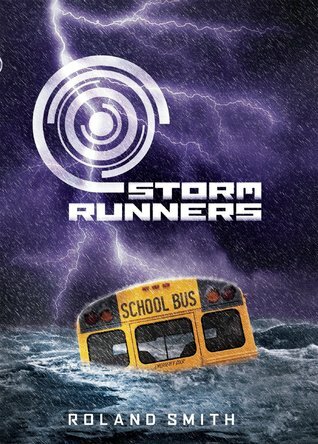 When Hurricane Emily is headed towards St. Petersburg, Florida, Chase and his father rush to beat the storm. It turns out to be far more than they expected. Roland Smith is the perfect writer for my students - a boy-heavy grade with only 6 girls total. They loved the suspense that he maintains throughout the novel and would ask every day if we could read more. I'm happy that there is a lot of information about hurricanes included, and even more that its inclusion isn't heavy handed. I also appreciated that the two main female characters were athletic, strong, and highly capable. My one quibble with the book is how it ended. It's the first in a series, but it practically ends in the middle of a sentence! I need thirty copies of the sequel, The Surge, to keep up with the demand of students who want to know what happens next.